Home for sale in Bentonville, AR located at 5 Honeysuckle Ct. in Pleasant View Neighborhood. Pleasant View is a great location and is an established subdivision. Great option for Wal-Mart Vendors that relocate to Northwest Arkansas - or for anyone looking for a great established area and a wonderful home in Bentonville. UPDATED KITCHEN W/STAINLESS STEEL APPLIANCES, GRANITE COUNTERS, NEW PAINT!!! 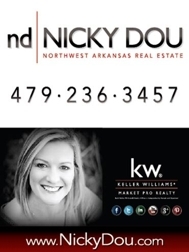 GORGEOUS HOME IN BENTONVILLE, AR @ a GREAT PRICE!